Is one of the consequences of the Pope Joan story, whether it was true or false, the use of a marble chair with a large, toilet-like hole in its seat? As the picture above shows, it seems that that chair has been a part of the papal enthronement, when the pope-elect had to sit on the seat naked from the waist down while cardinals filed past, either peering or feeling to confirm his masculinity. According to this Wikipedia article (which is in Dutch; there is no English version), the cardinals said 'Testiculos habet et bene pendentes' in confirmation of the pope having passed the inspection. What is the truth of such a papal testing? The chair was real, but its actual function is different from what the legend says. And actually, it seems to have been three chairs: one "commode"-type seat, and two porphyry "pierced" chairs. Read on for more. The alleged manual examination of the papal claimant's genitalia, performed by a junior deacon through a [sic] opening in the papal chair, aimed, of course, to guard against the election of another woman Pope. 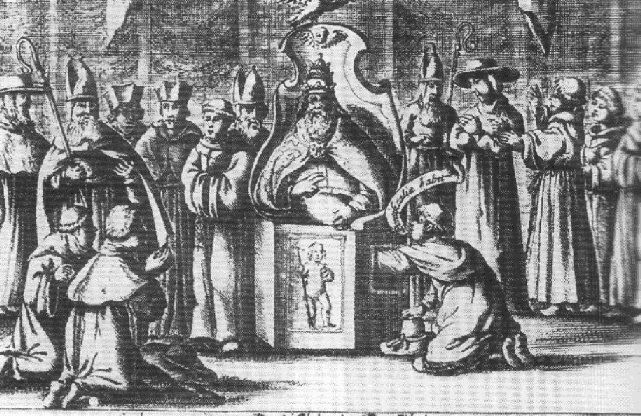 ... By 1406, the humanist Jacopo d'Angelo ... denies in his report of the coronation of Gregory XII that such a rite existed, and accounts for the false belief along largely correct lines by explaining the meaning of function of various chairs in the coronation ritual: one chair at the Lateran, called the sedes stercoraria [which means "dung chair" or "toilet"], on which the Pope sits to remind him "that he rises out of clay and dung," that is, that he is subject to the failings of our human nature; and two porphyry seats in the Chapel of San Sylvester (which, because they are pierced, Jacopo says, "the common people tell the senseless fable that someone touches him as he sits to prove that he is indeed a man"). Seated in the latter, the Pope receives, respectively, the papal staff and keys (i.e., the power to govern, granted by Christ to Peter) and a red belt hung with twelve precious stones (invoking the Old Testament priesthood). The two porphyry chairs had first been noted in the investiture of Paschal II in 1099, as found in the Liber Pontificalis. ... The "stercory chair" was eliminated from the rite of investiture in 1560, while the two pierced chairs were last used in the accession of Leo IX [sic; that should be Leo X] in 1513. One was taken from the Vatican by Napoleon after the Treaty of Tolentino and is now in the Louvre; the other is still in the Vatican Museum. The writing of Jacopo d'Angelo to which they refer is a letter to a certain Emmanuel Chrysoloras, which doesn't seem to be available in English. The editors claim indebtedness to The Myth of Pope Joan by Alain Boureau, so if you want to know more then that's probably a good place to look. In conclusion, though reports of the testicle verification rite go back a long way, so do contrary reports. The contrary reports make more sense (to me at least) and the reports of the testicular examination come chiefly from opponents of the Papacy and give confused accounts of what actually took place. My verdict, personally, is that it never took place but that someone saw the chairs with the holes and let their imagination do the rest. On a historical note, as with Pope Joan story, this too never happened. These the two myths became connected in a well circulated rumor which what eye-witnesses to medieval papal coronations believed they were watching. The result was the often repeated report of a public rite always seen by others, never by the narrator. If Pope Joan story is not true, then this ritual(?) will not be necessary at all. Because at any point no one would have doubted the masculinity of a Cardinal. But even if Pope Joan story is true, there are other better ways to make sure that the pope-elect is a man like pulling his beard etc., Even if it was done, there is no necessity to do it in public. Just like the conclave, it could have been done in private, which would make it impossible to be known to the outside world. Also note that the Wikipedia article that you have cited has no reliable reference. The oldest surviving version of the story is from the mid-13th century, believed to be propagated by the followers of a cult of Saint Guglielma. Interestingly these followers had their own "pope" too. 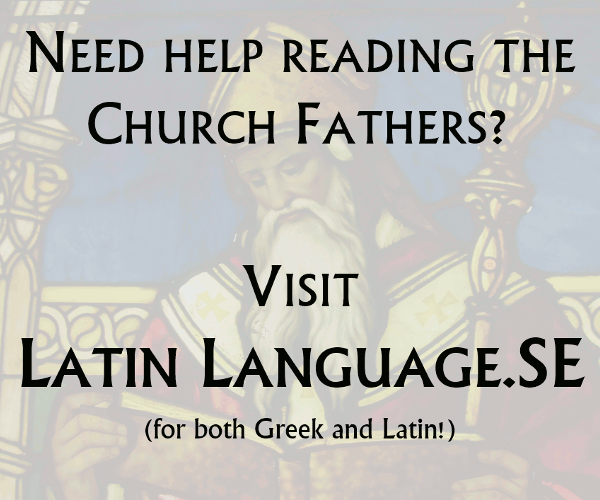 It is said that they were spreading these rumors to invalidate the catholic papacy. Were the Waldensians like a Protestant Church in the Middle Ages? What is the “city of seven hills” in St. Malachy's Popes Prophecy?